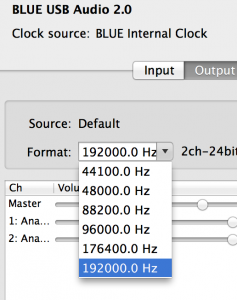 The installation documentation for windows is 2-3 pages, where the instructions for Mac is 1 page, and basically, “plug it in, adjust the volume.” Here are some tips, and fixes if you are using a Yeti Pro Blue microphone with your Mac. Ignore the “set the volume at 80%” suggestion. I set mine at 100%, and it worked great. The “set the gain in the middle” is a good suggestion. If you do happen to run into this little bug, here is how to fix it. The sample rates of the audio input and output devices do not match. Audio cannot be recorded until this is corrected. Use the appropriate operating system or audio device control panel to adjust the sample rates of the input and output devices to use the same settings. It means you are trying to record at a sample rate that is different than the playback rate. I got this error because I jacked my Yeti Pro up to the maximum 192kHz but my Mac Book could only play back at 96kHz. You can bump down the sample rate of your microphone to 96kHz. This is done in the Applications -> Utility -> Audio MIDI setup. You would do this if you didn’t need 192kHz sampling and you wanted to listen to the playback through your computer. In the graphic at right it is set to 192kHz, you’d set that to 96kHz, and you should be all set. You can tell Adobe Audition to playback the audio through the microphone. This sounds a little weird, but as you can see on the bottom of your mic is a headphone jack. 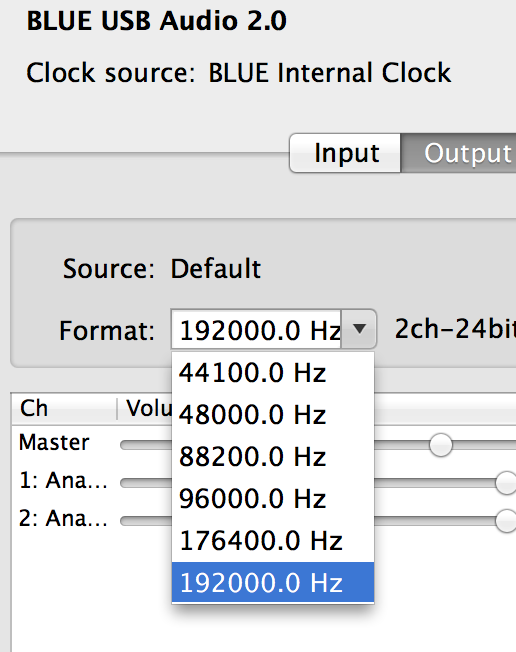 Plug your headphones into there, and your Mac will use this for output at 192kHz. Remember, if you choose this option, you won’t hear playback through your computer speakers or headphones. You have to have your headphones plugged into the bottom of the microphone. Elsewhere you can find plenty of discussions about proper settings for your Blue Yeti Pro microphone, and a lot of discussions about whether it really matters if you record at 192kHz or 96kHz. For the moment, all I know is that my first few tests with the microphone sound great, and I can’t wait to do some more recordings with it! I’ll never remember this in the future, but it works now – THANK YOU!